A mixed doubles game at the Bermuda Beach Tennis Tournament. 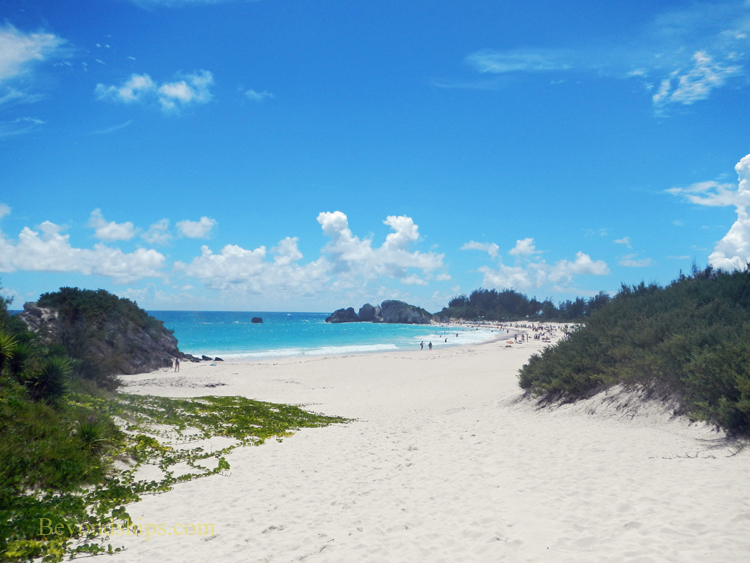 Bermuda is famous for its extraordinary beaches. Pink sand, clear water and surrounding rock formations that have been carved by the wind and the sea for centuries. At the more popular beaches, you see people doing the types of things that people typically do at beaches - - swimming, snorkeling, and just relaxing in the sun. 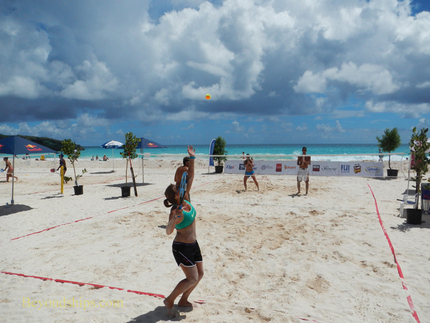 In addition, one activity that is catching on in Bermuda is beach tennis. Although the game is scored the same way as traditional tennis, beach tennis is played somewhat differently. The racquets are essentially paddle ball racquets and the ball is not as pressurized as a regular tennis ball. Of course, you cannot bounce a ball on a sandy surface so a volley takes place entirely in the air with each player trying to keep the ball from dropping on his or her side of the net. Speaking of the net, it is much higher off the ground than a regular tennis net. As a result, it is more difficult to hit a booming ace into the opposite court. (The boundaries of the courts are marked out with strips of plastic that lie on the sand). In some respects, the game resembles badminton with shots arching over the net from one court to the other. But inasmuch as the object being struck is a ball rather than a shuttlecock, the shots can be much more powerful. As Brannon pointed out, game strategy involves combining power shots with placement. Consequently, a beach tennis game is less genteel and more fast paced. Indeed, there are beach tennis professionals who make their living playing beach tennis tournaments. Below: Bermuda's Horseshoe Bay beach. For the tournament, a section of the beach is leveled off and four beach tennis courts are set up. Pavilions bearing the names of commercial sponsors overlook the courts. There are no grandstands. Instead, spectators sit on the sand or on beach chairs. This is not Wimbledon or the U.S. Open so there are not hordes of spectators. Rather, fans sit in small groups, their numbers augmented by occasional beach-goers who stop to watch the action. Spectators are never miles away from the action as you can be at a major tennis tournament. Also, unlike most major professional tennis tournaments, there is no charge for admission to the Bermuda Beach Tennis Tournament. The tournament is an annual event in Bermuda. However, that does not mean that there is no beach tennis the rest of the year on the island. During the spring, summer and autumn, each Sunday, beach tennis courts are set up at another well-known Bermuda beach - - Elbow Beach. There is a $10 charge to play, which includes the use of racquets and balls.